More than a decade has passed since Bartolo Colon squeezed into an Indians uniform. He returned to Progressive Field with the Mets on Friday night and displayed his age-defying fastball, helping send his former club to a 6-5 loss in the opener of a three-game Interleague set. It was good for Colon's 219th career victory, tying Pedro Martinez for second all-time among Dominican-born pitchers. "It means a lot," Colon said. "Pedro Martinez back in my homeland of the Dominican Republic is a special person, and to do it here in Cleveland is something special for me." The Indians struck for three runs in the ninth inning -- two via a home run by Carlos Santana-- but it was not enough to overcome New York's early cushion. Backed by a quartet of home runs, Colon worked into the sixth inning and limited Cleveland to an RBI single by Mike Napoli in the first inning and an RBI double by Jason Kipnis in the fifth. The 42-year-old Colon -- signed by the Indians in 1993 and traded as part of a blockbuster deal with the Expos in 2002 -- struck out five and walked one as his season ERA climbed to 2.13. "He throws strikes. You know what's coming," Indians manager Terry Francona said of Colon. "When he locates, he's very tough. We had a couple chances and we got him out of there, but I think we just ran out of innings." Homer-happy: A Mets team that came into the night with just two home runs over its first eight games broke out for four of them in five innings -- including three blasts over a six-batter span in the fifth. De Aza opened the scoring that inning with a tiebreaking solo shot, giving the Mets a lead they would never relinquish. 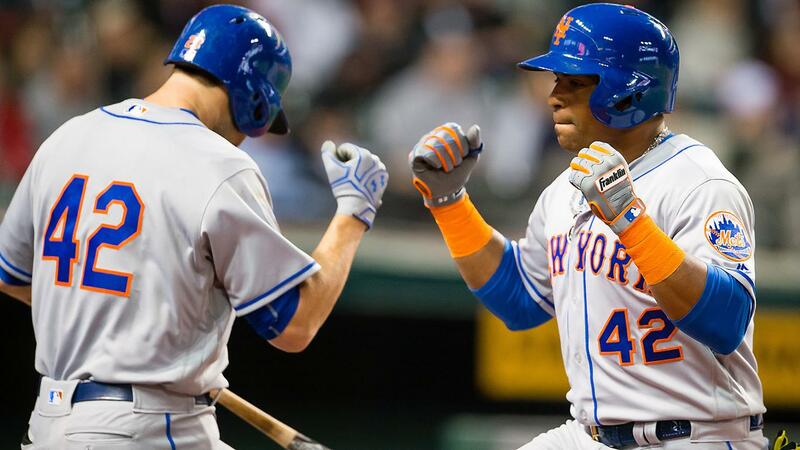 Cespedes followed with a two-run homer to center. Two batters later, after a Lucas Duda single chased Anderson, Neil Walkergreeted Ross Detwiler with his first home run as a right-handed batter since 2014. A long walk: Santana pulled a Colon pitch down the right-field line and into the stands in the first inning, and trotted around the bases for what he thought was a two-run homer. The umpires convened and changed the call to a foul ball, and manager Terry Francona declined the chance to challenge the ruling. Santana then drew a walk and Colon escaped the inning by striking out Tribe catcher Yan Gomes. "It was hard to see. I was thinking home run," Santana said. "But, they called it foul. When I came back, I was concentrating to hit. Everybody told me it was hard to see. It was hard. But it was a foul ball." Take two: With two outs in the ninth inning, Santana made sure there was no doubt about the next pitch he sent over the wall. Facing Mets reliever Addison Reed, Santana shot the first pitch he received to straightaway center, where it sailed beyond the reach of leaping center fielder Juan Lagares. The two-run homer, combined with an RBI single by Marlon Byrd later in the inning, cut New York's lead to one run, but that was as far as the comeback went. For the fourth consecutive game, Collins turned to closer Jeurys Familia, who allowed three straight baserunners before nailing down the final out. "I'll always feel like we're going to win," Francona said. "I don't think we want to be down four going into the ninth real often, but if we do [what we did in the ninth] enough, we'll win one of those." Sacrificing a rally: After Byrd and Juan Uribe opened the second with consecutive singles off Colon, Tribe rookie Tyler Naquin attempted to move the runners with a sacrifice bunt. Colon fielded the chopper and got the lead runner (Byrd) at third base, and then followed with two quick outs to sidestep any harm in the inning. Colon went 75-45 with a 3.92 ERA in 162 career appearances with the Indians from 1997-2002. Prior to Friday night, though, Colon had not picked up a win at Progressive Field since May 18, 2005, during his American League Cy Young Award-winning season with the Angels. In the second inning, former Indians infielder Asdrubal Cabrera pulled a pitch from Anderson into the right-field corner for a double. Walker appeared to score from first on a bang-bang play at the plate, but Francona requested a replay review of the 9-4-2 relay. The call on the field was overturned after it was ruled that Gomes applied the tag on a sliding Walker just before he touched the plate. That kept the game in a 1-1 tie. "Gomes with a good tag," Francona said. "Fortunately, early, it got overturned, because that was, at the time, a huge play for us." Mets: Matt Harvey will look to accelerate past his slow start to the season when the Mets return to Progressive Field for a 4:10 p.m. ET game Saturday. With only five strikeouts and a 4.63 ERA over his first two starts, Harvey will be aiming to do far better in his first career meeting with the Indians. Indians: Right-hander Josh Tomlin will take the mound for the Indians on Saturday for his first start of the season. Because of three postponements due to weather and a couple of team off-days, Tomlin will have gone 17 days between starts. In his final spring outing, Tomlin struck out 10 and walked none in six scoreless innings on March 29.